By Paul Underwood in Coding. Updated on August 3, 2018 . 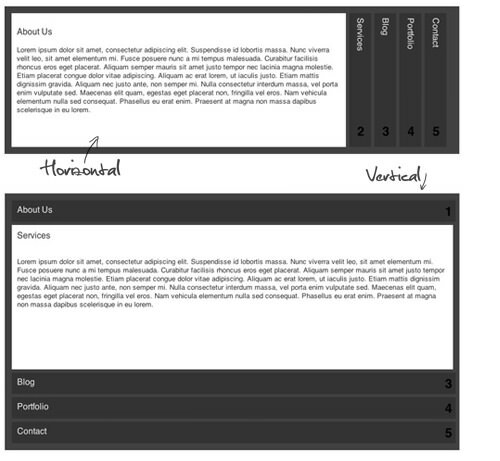 We are going to create a horizontal and vertical content accordion. On clicking the headline text the slide will open displaying the full content, and here’s a quick preview (screenshots) how they look like. Like what you see? Let the coding begin! To start with we are going to create the HTML for the accordion. 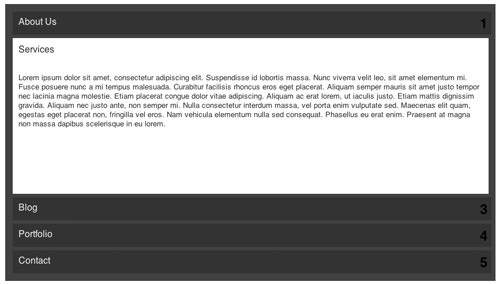 The structure needs a container div and then have a section for each slide in the accordion. In this example we are going to have 5 slides. Each of the slides are going to have a title and a paragraph for the content. Now we have our slides we can begin to style the accordion. First we need to style the containing div of the accordion. This will give us an idea of how to display each of the slides and each of the headlines. Next we are going to create the headlines for each of the slides. We are setting the background color to be dark grey on the section to be the headline where the visitors will click to display the slide. We are using this section for both the headline and the content which means we are able to use less HTML and reuse the title of the slide as the headline of the content. At the moment all the slides will be closed so we need to make sure that the paragraph is hidden from view until the slide is open, so for now set the display of the paragraph to none. With the slides closed we want to display a number at the bottom of the headline to say which number slide we are on. For this we are going to use CSS to add content after the section headline, this can be done by using the :after pseudo-class selector. Now we have created the headline for the slide we can make the click event to display the slide in the accordion. But there is a problem, CSS doesn’t have a click event, which is why the accordion is normally created by using jQuery so we can attach a click event to the headline text. We need to mimic the click event in CSS which can be done by using the :target pseudo-class selector. :target allows us to style the fragment identifier. Sometimes we use an on-page anchor tag to point to a place on the page. On clicking the link the id in the anchor tag becomes the target and you can style this by using the :target selector. To add this into the accordion we need to add a link around the headline pointing to an id of the slide. The above code will change the size of the slide to fit the rest of the accordion and changes the background color to white. The paragraph was hidden so now on target we need to display the paragraph. Now when you click on the headline of the accordion the slide will change style to display the content of the slide. The above code will create the general accordion now we can start to make the CSS changes for the differences between the horizontal and vertical accordion. Both these accordions have the same functionality but the headline styling would be different. First we set the width of the headline section to 5% so it is a closed slide. As the section is both the headline and the content for the slide we need to add the animation to display the content by using the transition property. The position of the number on the slide will be the same position on each closed headline these are positioned differently to the vertical headlines. The above code will change the size of the slide to fit the rest of the accordion. The headline was rotated vertically to run down the headline but now with the slide open we need to change the text back to be horizontal by rotating the text back to 0 degrees. The vertical accordion works the same way as the horizontal accordion except we need to change the height instead of the width and we don’t need to change the alignment of the text. On the target event of the vertical accordion we are going to change the height of the headline to display the slide. The above will change the position of the headline text on the closed slide. With the closed slide we need to set the position of the number which is located on the right of the accordion. When the slide is open we need to hide this number on headline when the target is set so we change the left position off the screen. Editor’s note: This post is written by Paul Underwood for Hongkiat.com. Paul is a PHP Web Developer from Bristol, UK. He writes tutorials about Web Development: main subjects include PHP, jQuery, CSS3 and HTML5. He also records useful code snippets at Paulund.co.uk.